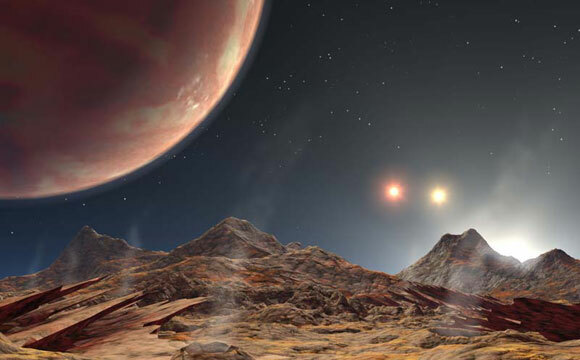 This artist’s concept of HD 1885 Ab, the first known planet to reside in a triple-star system, would have a similar sunset to KELT-4Ab. Both systems host a pair of stars distantly orbiting the planet-hosting single sun. Using the Kilodegree Extremely Little Telescope, a team of astronomers has discovered an alien planet that has three suns in its sky. While the composition of the planet’s atmosphere isn’t yet known, standing in the atmosphere above the planet the single star would appear to be about 40 times as large as the sun appears in the sky on Earth. Each member of the binary star pair would be almost as bright as the full moon, though without a good telescope they would look like dots of light about a pinky-finger-width apart in the sky. “Hot Jupiters aren’t supposed to exist. None of them,” Eastman said. When astronomers developed the first theories of planet formation, all they had to work with was the solar system. When the first exoplanet discoveries were gas giants that orbited their stars in a handful of days, it turned the existing theory on its head and sent scientists scrambling to understand how the newly observed systems could exist. Most scientists seem to agree that the massive worlds traveled to their current position after they finished forming, driven by companion planets, stars or other processes, Eastman said. “The binary system KELT-4BC may be what ultimately drove the planet KELT-4Ab so close to its star,” Eastman said. Using a survey produced by KELT, the scientists identified the potential planet KELT-4Ab, then confirmed its existence with several other instruments. Like the more well-known NASA Kepler spacecraft, KELT relies on the transit method to detect exoplanets, observing how the amount of light from a star drops as the planet passes between it and Earth. These features deliberately bias the instrument toward brighter stars, which Eastman said allows a broader range of observations and characterizations. Among those is the ability to determine if the planet’s orbital plane appears edge-on as seen from Earth, or whether the plane is tipped, and this process allows scientists to more precisely calculate the star’s mass. When the KELT-4 system was originally observed in 1973, it was thought to host only two stars. Not until Eastman observed the system almost 40 years later was one of the single stars resolved into two individuals. “In all previous observations, KELT-4B and KELT-4C were blended together and looked just like one star,” Eastman said. This is a recurring challenge for scientists observing binary systems — resolving close-orbiting stars into binary pairs. Eastman said that many known planets may live in unknown triple systems. One reason the twin stars in the KELT-4 system were so easily identified as two individual stars instead of one was because of the system’s close proximity to Earth. The European Space Agency’s Gaia satellite, currently engaged in a five-year mission, will observe the triple system in the coming years. These observations will enable a more precise measurement of the distance to KELT-4A, providing more detailed measurements of its mass and radius, which will result in more precise measurements of the mass and radius of the planet. “But more exciting, Gaia will be able to measure the motion of the KELT-4BC binary pair around KELT-4A,” Eastman said. Measuring the path of the pair of stars will help improve models of how they could have affected the migration of the planet, shoving it closer to its parent star. In doing so, it will help scientists understand how hot Jupiters manage to form so close to their parent stars. Be the first to comment on "Hot Jupiter KELT-4Ab Boasts Rare Triple Suns"